I feel like we've talked about money a lot over the past couple of months. I don't want to be the church that always talks about money. But at the same time, we have invested too much in Access to start coasting now. We want to face the new year strong. We're committed to great things in 2008! So, we have to be honest about the fact that what we do is expensive. You can join us in creating relevant environments for children, students and adults, and help Access achieve our mission of leading people into a growing relationship with Jesus Christ. Please pray about this as a family. 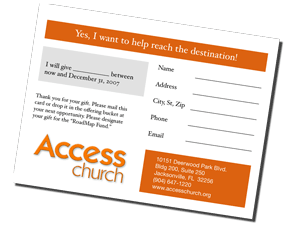 Ask God to be intimately involved in this decision about making a strong year-end gift to the church. Then, fill out your pledge card (you can download one here) and drop it in the bucket this Sunday. You can also give online. We are still a long way from reaching our goal of $300,000 by December 31, and your gift will help! "I helped change the world."